It’s not a rhetorical question. I really want you to answer. In the comments below (if you wish), or simply in your own head right now. Because it’s vitally important that you have a clear answer to that question. The reason why knowing your answer to this question (and occasionally revisiting it) is so important is because it will help keep you from wasting time and money on social media activities that are not helping you move the ball forward. The great danger of social media is that it is way too easy to do exactly that. And aimless social media activity is one of the greatest threats to the productivity and success of online content creators. So, why do you use social media? Got your answer? Good. Now let’s discuss tools that will help you use social media better. This is the entire reason to be on social media. Sure, you can just use social media as a distribution channel and auto-broadcast your links, but you’ll never truly harness the power and potential of social media that way. To get the most out of social media, you need to be engaging with the actual people who are there. And really, it should probably mean all of the above. You’d be wise to not spread yourself too thin though. So pick a channel or two to really focus on, and go all out. And always keep the #1 rule of social media engagement in mind: be authentic. Here’s the thing about being on social media: it stays on 24/7/365. But here’s the thing about you: you can’t. Which is why social media scheduling is so important. It allows you to have a presence on social media and meet your people where and when they are there, even when you can’t be or choose not to be. But basic scheduling (e.g., arranging for a tweet to be posted at 8:00 p.m. with your new blog post link) is only the bare minimum. When you get into more complex scheduling like sending out links to evergreen content at predetermined date and time intervals, then you start to unlock a deeper potential for social media as a broadcast channel that keeps all relevant content in your archive alive forever. Social media is an inherently visual medium. This ain’t some black-and-white terminal chat where only text matters. In fact, text is the absolute bare minimum starting point for attention. What you really need are arresting visuals — an eye-catching image or a stop-people-in-their-tracks video. With every social media channel now saturated to the brim with people and content, you need more than just flat text on a screen to stand out. If you know your answer to that question, then you’re naturally going to want to know if your actions are leading to the achievement of your goals. So, you need a way to analyze the impact of your actions. Did this design or that design work better? Is your scheduling working, or does it need to be optimized? Is anything that you’re doing actually impacting bottom-line numbers like traffic, subscriptions, and sales? Don’t fly blind. It’s how you waste precious resources on social media doing things that don’t actually have an impact. You can certainly log into each social media site and get a lot done just using their native tools. But, again, you’ll never be able to unlock the full potential without specialized tools that were created specifically so that you can engage, schedule, design, and analyze better. 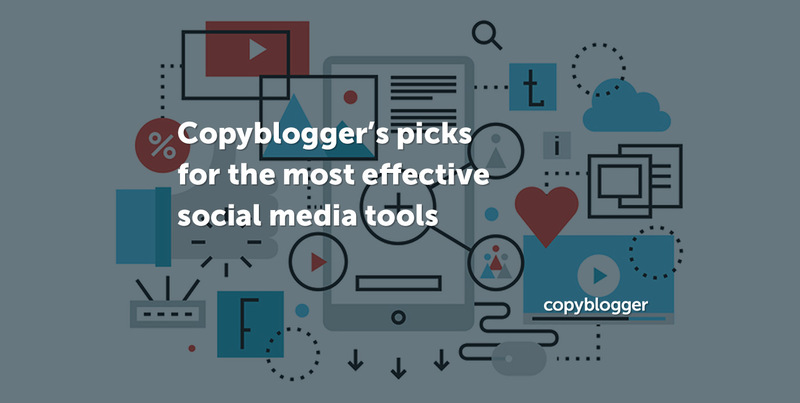 And that is why we created the Copyblogger Guide to the Best Social Media Tools. It runs down the tools we trust the most for each function (and some of the subfunctions contained therein). So check it out, identify some new techniques to try, and take your social media usage to the next … more productive … level. I love the way you use ESDA to describe the four functions! One word: Awesome! I use social media to garner insights. I’m this research hungry animal who wants to know the idea and thought behind people’s behaviors and actions. So, yeah..I use social media to study patterns. Thanks for the tools and introducing me to Cyfe (looks promising)! Great info here, Jerod- are there tools you would recommend for companies based on size? For instance, which tool would be better for a smaller company with a smaller budget, etc…I will check out each tool individually. Thanks, Jerod. Great article. I use TailWind for Pinterest. It works fantastically to schedule posts to Instagram and Pinterest. I am looking at trying out CoSchedule as well in the near future. I checked out the Guide also. Well done.